Forget about seeing the sites listed in the guidebooks and dare to discover the most spectacular places in Catalonia, Spain. Expect days of tours with a wide network of roads and tracks that allow step into the park enjoying spectacular landscapes, hidden nooks, and observation of nature up close and in perfect condition. 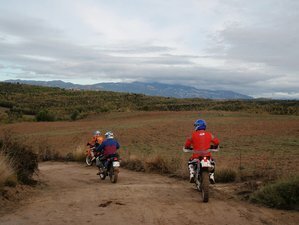 Motostrailadventure organizes guided tours for offroad riders across the best landscapes of Berguedà, Pre-Pyrenees with rental or bring-your-own bike options. The base of the excursions is a hotel near the town of Berga, the capital of the region. The rooms will be shared. Arrive at the hotel in the afternoon, presentations, and dinner. Have your breakfast and route to the marsh Llosa del Cavall and village of Sant Llorenç de Morunys where you will stop to eat. The route is not complicated but has spectacular, beautiful landscapes and ravines. There will be some rivers crossing and some climbs so give them gas. After breakfast today, you will make a route towards the so-called Central Catalunya. This route is a little technical route for its bumpy terrain and possible pools of mud but affordable. You will see charming villages like Sant Feliu Saserra (witches' village - according to the legend), Sagas, and solitary hermitages. Being the last day, you will do a couple of short excursions around the area where you will enjoy the terrain, landscape, and gastronomy. The tours are adapted to all levels of driving although it is always better to have some experience. The tour includes a couple of short excursions around the area where you will enjoy the terrain, landscape, and gastronomy. Antonio has traveled throughout Europe and Africa and is an expert pilot with 20 years of experience. Good knowledge of her land and corners, Ana is an owner of fine arts and with four languages (English, German, Italian, and French). The Berguedà, also known as Pre-Pyrenees, is a space where any time of the year is good to visit and to carry out activities. Nature lovers will find the Cadí-Moixeró - one of the largest natural parks in Catalonia, the Pedraforca, and other protected natural areas such as the La Baells reservoir. Daily breakfast and dinners are included in the price. Enjoy homemade and traditional Catalan food during your stops in emblematic and interesting places. Please book your flights to arrive at Barcelona-El Prat Airport (BCN). Transfer from and to this airport is included in the price. Motostrailadventure will pick you up at the airport. Airport: Barcelona–El Prat Airport Airport transfer included: Barcelona–El Prat Airport No additional charges. You can request this in the next step. Motostrailadventure organizes guided tours across the best landscapes of Catalonia, Aragon, Pyrenees, and Andorra all year round with a wide catalog of routes. For a rider bringing their own motorbike, the price is 1,025 EUR.